Most of the Volkswagen/Audi group (VAG) of vehicles found in the UK today use one of two key systems, the standard double sided cylinder key or the laser cut key. Both these types of key can be supplied as a standard plastic top key or as a central locking remote key. The standard cylinder key found on many vehicles today was first introduced around 1985 and were used until 1998. This key uses 7 positions with depth cuts from 1-4. The laser cut key is latest design and consists of a flat steel blade which is milled through the centre of the blade creating a “wavy line”. The most common key of this type was introduced around 1999 and uses 8 positions with depth cuts from 1-4. In 2016 VAG Group introduced a variation to this key with a 9 and 10 cut key which incorporates additional side in addition to the regular top and bottom cuts. This key still has depth cuts of 1-4. At Devon Car Keys we are able to gain entry to vehicles fitted with either of these type of locks quickly, easily and without any damage to your vehicle, even if the vehicle is deadlocked. We do not wedge the door and frame apart and insert wires into the vehicle to pull handles, which can damage the vehicle paintwork, nor do we insert wires into the door cavity as there is a risk of damage to the linkage arms which operate the locking mechanism. If you have lost your only Skoda car key don’t panic. At Devon Car Keys we are able we are able to gain entry to vehicles fitted with either of these type of locks quickly, easily and without any damage to your vehicle, even if the vehicle is deadlocked. We do not wedge the door and frame apart and insert wires into the vehicle to pull handles, which can damage the vehicle paintwork, nor do we insert wires into the door cavity as there is a risk of damage to the linkage arms which operate the locking mechanism. In the event of you losing all your keys we can quickly and easily decode your lock with our specialist equipment, usually without the need for the lock to be removed from the vehicle, and cut a working key ready to program within 5 minutes. With our specialist diagnostic equipment we can read the immobiliser pin code and program new keys to your vehicle at the roadside, so no need for the vehicle to be recovered to the dealer. If you have broken your Skoda car key we can attend site and supply you with a replacement, even if it is your only key. We carry a wide range of remote central locking keys ranging from standard and flip out blades, to the newer style Skoda proximity or smart keys. These remote keys can be cut and programmed on site from our mobile workshop, without the need to book your vehicle in with the dealer. We also carry replacement remote blades for all Skoda remote keys. 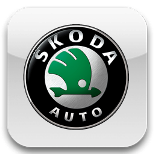 A common problem with Skoda car keys is the key becoming worn and difficult to turn in the door or ignition. When this happens it is pointless duplicating the key as this will not solve the problem. At Devon Car Keys we can decode the locks and cut you a brand new key from the key code. This can all be done at your home or work at a convenient time to suit yourself from our fully mobile workshop. If you require your Skoda locks and ignition to be changed we can offer either a complete replacement lock fitting service, or we can re-key your existing locks to a new key number, providing you with new keys without the expense of having to replace the entire lockset.